Students from Germany recently made Whitefriars Monastery the subject of a series of studies on the fabric of the Grade 1 listed building and its possible re-use. The exercise had been organised by Architecture Course Leader Sabine Coady-Schaebitz at Coventry University’s Department of the Built Environment. Pictured left are students studying the medieval roof structure. The eleven students and two professors from Hawk University in Hildesheim split into three groups to study the outstanding timber construction, the sandstone walls and possible improvements to make the re-use of the building a viable possibility. Near to Whitefriars Monastery and fronting onto Gulson Road Coventry University’s new Engineering and Computing Centre is fast taking shape where Gulson Road Hospital once stood. The building, designed by Arup Associates, is strikingly modern and consists of two L shaped blocks that are said to represent science and nature. High standards of sustainable and green technology are being incorporated within the building, including photovoltaic arrays and a planted roof. One of the buildings boasts a dramatically stepped and raked elevation, whilst the other features a sharp angled facade. The building is the result of an architectural competition and Arup’s winning scheme beat off entries from the likes of Foster & Partners, Fielden Clegg Bradley and Wilkinson Eyre. The Coventry Society applauds this approach to modern architecture and Coventry University’s insistence on securing a building of real quality is to be commended. We believe that this approach should become commonplace amongst other developments in or around the city. Coventry deserves the highest standards of modern architecture to compliment its rich heritage. The regeneration of the land between Gosford Street and Gulson Road with modern Lanchester library, restored William Morris building and the Engineering and Computing Centre now under construction looks set to regenerate this important section of the city. With now hope to see plans to re-use Whitefriars come forward. It’s disappointing to see another arson attack on one of the city’s heritage buildings. Just five years ago the Society had made an urgent request to English Heritage for listing of 31 Allesley Old Road, but once again it was turned down because of a lack of original features within the building. While local listing acknowledges its status—built in 1851 when Chapelfields was being developed as a new watchmaking quarter, we know only too well how, without statutory obligation on the owner to look after a property time goes by and there is the ever increasing risk of losing the building completely. There are a number of first class examples of heritage building re-use in the city and we urge the owner to start talking to the Council and possible ways forward before No.31 is reduced to rubble. 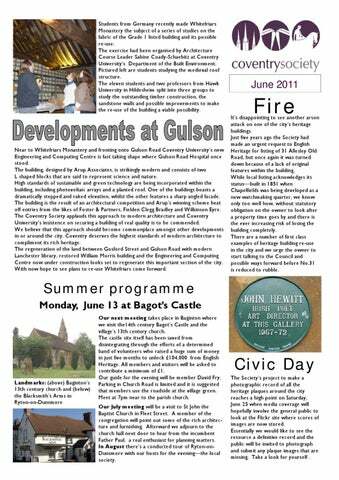 Our next meeting takes place in Baginton where we visit the14th century Bagot’s Castle and the village’s 13th century church. The castle site itself has been saved from disintegrating through the efforts of a determined band of volunteers who raised a huge sum of money in just five months to unlock £104,000 from English Heritage. All members and visitors will be asked to contribute a minimum of £1. Our guide for the evening will be member David Fry. Parking in Church Road is limited and it is suggested that members use the roadside at the village green. Meet at 7pm near to the parish church. Our July meeting will be a visit to St John the Baptist Church in Fleet Street. A member of the congregation will point out some of the rich architecture and furnishing. Afterward we adjourn to the church hall next door to hear from the incumbent Father Paul, a real enthusiast for planning matters. In August there’s a conducted tour of Ryton-onDunsmore with our hosts for the evening—the local society. The Society’s project to make a photographic record of all the heritage plaques around the city reaches a high point on Saturday, June 25 when media coverage will hopefully involve the general public to look at the Flickr site where scores of images are now stored. Essentially we would like to see the resource a definitive record and the public will be invited to photograph and submit any plaque images that are missing. Take a look for yourself . A planning application has been submitted by the Coventry Cyrenians for the installation of traditional shop fronts to numbers 98 to 100 Far Gosford Street. The building currently features modern brick work at ground floor level with security grills that present a tired and oppressive frontage to the Far Gosford Street Conservation Area. The plans submitted aim to create a more active frontage with glazed shop fronts and traditional wooden surrounds. The Coventry Society believes that these plans will compliment the excellent regeneration taking place elsewhere along the street. Another scheme ongoing is the restoration of numbers 38-40 Far Gosford Street, a row of statutory listed timber framed buildings adjacent to the former Beer Engine pub. The buildings are still covered in scaffolding but the restored roof tiles and end gables can be glanced above the netting by the keen observer. We look forward to seeing completion of this project in the coming months. visualisation. The issues regarding traffic have been carefully considered and widely consulted on. In the Coventry Society we do understand that cars can add life to streets which is why we are pleased that the Broadgate pedestrianisation will be enforced through rising bollards, allowing the City Council to experiment with allowing cars in during the evening. We too support shared space and shared surface approaches to the public realm, which is why we support them in the other 2012 proposals and have urged these radical ideas to be applied more widely. Mr Watkins makes a number of assertions as a self-appointed expert which are questionable. He asserts that Broadgate would have benefitted from a ‘striking design concept’. Perhaps if we were designing a park or garden, but we have seen throughout the last few decades how such thinking creates spaces which are impractical and unusable. One only needs to look at Millennium Place or Belgrade Square for examples of where designs imposed from above clutter and impede public use. The examples he gives are unhelpful. Sheaf Square in Sheffield benefits from one stunning but very expensive piece of public art, but is otherwise very simple. Old Market Square in Nottingham is a much bigger space than Broadgate but has at its heart a large flat, uncluttered area, probably bigger than Broadgate. Why not look instead at the great public squares of Europe such as the Piazza del Duomo in Milan, the Maarkt in Brugge or Copenhagen’s Amagertorv? These are simple uncluttered spaces, with good quality paving surfaces. They are to be found at ‘nodes’ where pedestrian routes cross; they allow the life of the city to happen; activity spills out from the active retail and leisure businesses around them. Perhaps Mr Watkins would condemn these great public squares as ‘unimaginative minimalism’. 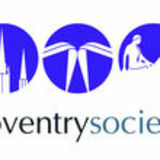 The Coventry Society has been very critical of some City Council plans for the city centre. While it is easy to be critical of these proposals, what we find refreshing is that they do not seek to sweep away the street plan of the city but build on it and improve it, and they recognise the centrality of Broadgate as the ‘top of the town’. They deserve a more considered appraisal than that given by Mr Watkins and recognition of the honest intentions and hard work of those involved.